Recognizing the relation between inhabitants and their built environments as a feedback loop, our aim is to capture the temporality of this loop in various scenarios of adaptation. 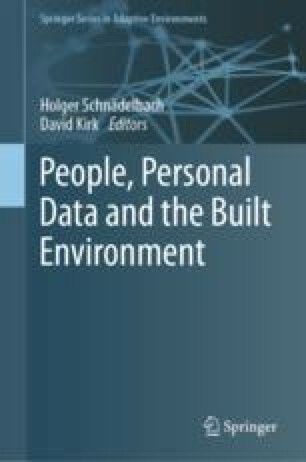 We specifically focus on the emerging types of adaptation that are motivated by digitally acquired personal data, leading to either automation or action taken by the building stakeholders. Between the microscopic daily mutations (e.g. automated adaptation to occupants’ presence or activity) and the macroscopic evolution of built environments, we identify a “mesoscopic” scale and argue for broadening its consideration in the research domain of adaptive built environments. In mesoscopic adaptations, inhabitants’ data undergo a process of thorough analysis and scrutiny, the results of which inform the re-envisioning of building design for its next cycles over the course of months-years. This contribution distinguishes and elaborates on four temporal scales of adaptation (minutes-hours, days-weeks, months-years, decades-centuries) and then exemplifies the meso-scale with a study conducted over three years within a living lab context. Through this example, we also aim to demonstrate the opportunity for living lab methodologies to contribute to the research on adaptive built environments at the mesoscopic scale.